Current e-commerce solutions have changed the global market in very diverse, revolutionary ways for the last few years – and the future is yet untold. The way customers all over the world purchase products on online channels is still to be defined. 10 years ago, the e-commerce industry started the rapid revolution of global trade, changing the consumer behaviours across the countries of markets globally both developed and developing. According to global statistics, in 2018 more than 1.79 billion people across the world purchased some products on the internet – e-commerce websites, online stores, global e-commerce platforms like Amazon.com. This ongoing digital revolution has been allowing the customers all around the world to search for products, compare the prices and finally, purchase the product at best possible price. Either on the online store or in person at the nearest store. But does it really still work this way in 2018? As stated before, in 2018 more than 1.79 billions of people worldwide decided to make a purchase using online channels. All the advantages of the e-commerce, developing the interfaces of the online shops as per latest user experience trends, social selling strategies make the products we are interested in almost reaching out to us. Tempting us with many different methods – content marketing, email marketing, special in-store promotions and digital advertising. Most of the online buyers took up the decision of shopping online after reviewing the available data, seeing inviting content and ads, entering in the world of optimization engines and recommendation solutions as well as social selling. And that last technique has been definitely growing the most throughout the last years – allowing the social selling to expand and convince more interested consumers, letting the brands engage their potential customers and convert into paying clients. In the current times, according to Marketing 3.0 Rules, it became more important to present the value of the product, exposing its benefits, characteristics and usability. For example one of the global retail leaders – IKEA Group announced the implementation of new global standards in their sales strategy and company development. At last, they opened completely their business in online services and channels, decreased the number of staff in local stores and invested in changing the global format of their local activity to smaller, better organized stores. It was obviously all followed by global marketing activities and a dedicated digital strategy tailored to business needs and market potential. The social selling strategies are growing very fast and nowadays, most of the global market players are trying to detect and reach out to their customers with the use of advanced technology. At SentiOne, we developed a solution called SentiOne React – a technology giving its users the opportunity to detect mentions with specific keywords, get engaged in discussions, using the same channel as your customers, and deliver the high-quality customer experience. Sell & Engage with your customers! This way, just by adding additional keywords defining the specific product, you are ready to find all the mentions across the web on multiple online sources.- Most of them would pop up in social media channels, and the internet forums. Now, there is nothing holding you back from getting in touch with your potential customers! And there is more – our system, only from January 1, 2018, to October 31, 2018, detected over 732 200 such online mentions written in English. Imagine having a chance to adjust the search to specific products of your company or industry – the only thing left is to… start selling! Marketers say that social selling is a new trend for building customer relations and assuring the growth of the business. However, we still have to remember that marketing strategy has to get adjusted to customer needs. 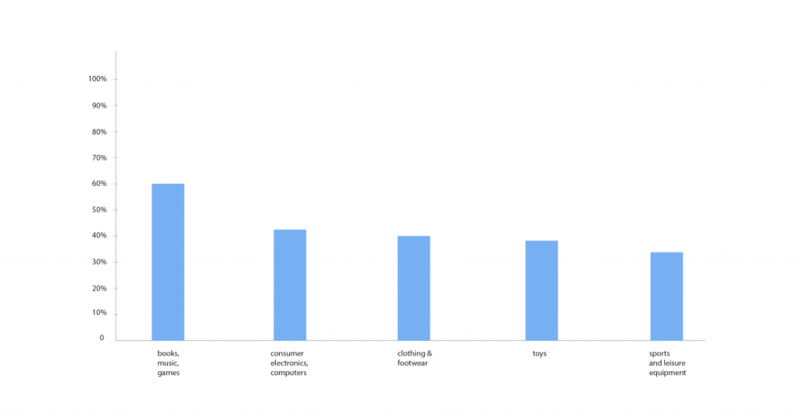 What do we buy through e-commerce? Today’s online community searches for a very detailed variety of products on the internet. Knowing this, most brands decided to adjust their online activities in order to meet their clients’ needs and requirements. As we already know, 61,6% of internet users across the globe already made a purchase online which makes 1.79 billions of people using the technology to make their lives easier. 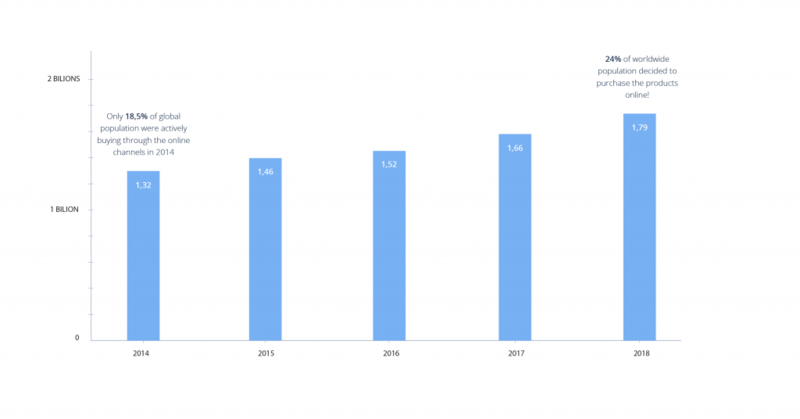 Latest studies at Statista say that during the last 12 months the global conversion from visitor to purchase has been on the level of 2,89%. It means that on average, out of 100 people visiting the e-commerce sources, almost 3 completed a purchase. And it’s still growing month-to-month! Now let’s see what customers buy on the internet. This is probably not a rocket science, as most of us have already experienced purchasing such products and then receiving a delivery to our home, office, or public delivery spot. Over the last few years, the logistics and delivery industry has developed a lot. We are not talking just about the parcel lockers or trucks driving from one city to another anymore. Now the logistics industry goes for the complete workflow automation – high advanced logistic centres, autonomic trucks or drones delivering our orders straight to our doors, without a single human touch. These solutions are yet in the development stage, but for sure they will bring the revolution to our everyday habits, giving even better user experience! What if a crisis meets e-commerce? Using a social listening tool such as SentiOne, you can detect the potentially critical situations. And make no mistake, they happen all around us! The most common problems in the e-commerce industry happen because a package was lost, broken, or found a wrong owner. Users across the web usually express their emotions on the social media channels, often tagging the company responsible for the deliveries or the producer. Most of the companies have a strict Code of Conduct clearly saying how to treat their customers and solve the delivery issues that are risky for brand’s image. All over the analyzed period of time we monitored and verified many mentions across the online channels, and realized that most of the companies are following the Code of Conduct in customer service. 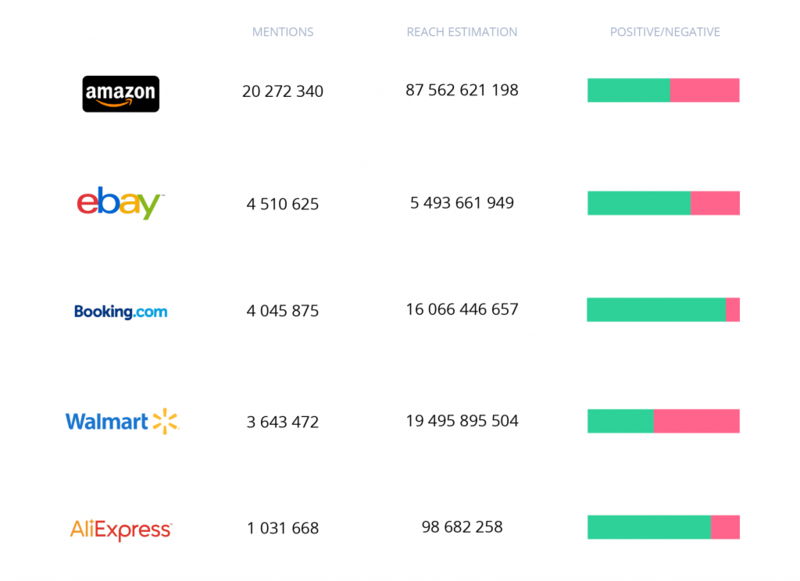 Majority of the global e-commerce platforms are reaching their disappointed, dissatisfied customers right away when the problem is appearing – not only on their own social channels managed by a dedicated team but as well going further and reaching those who suffer from not receiving their packages on time (or not at all!). Thanks to the monitored mentions we do know, that customers are very actively informing the brands about the delivery issues. Top three sources throughout the current year were Facebook, Trustpilot and Twitter – people who purchased the product were mostly men – 68% vs 32% of women that shared their negative feedback on how bad their experience with online orders happened. Afternoon time, from 4:00 PM on Wednesdays was the most spoken period of sharing their concerns and asking the brands to solve the queries. In such a case, the brand with strong external image is required to detect and react on critical mentions in the shortest time possible, giving people who trusted them, quick solution and fix of the issue, and if it’s not possible, keeping the dialogue with those unlucky ones waiting for the delivery to arrive. 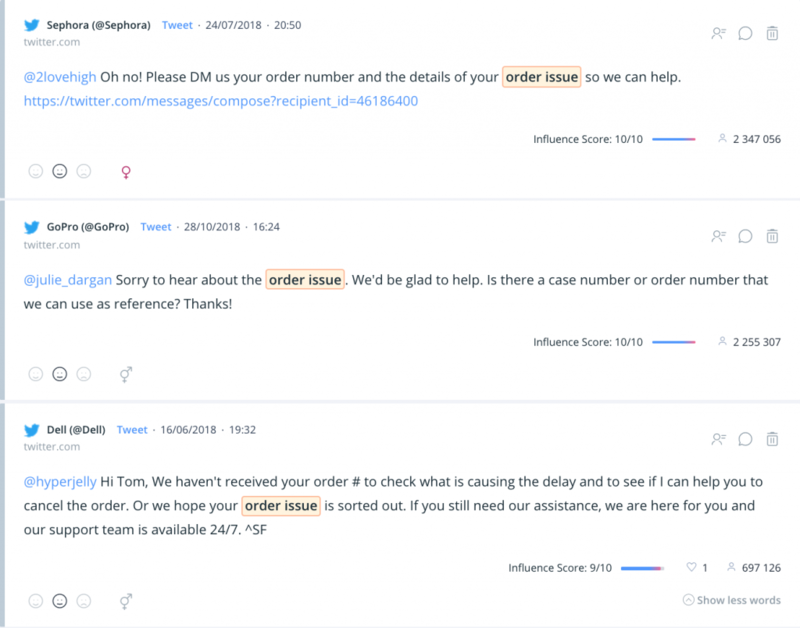 In such situations it’s crucial to detect mention as quick as possible after its appearing and then right away letting the disappointed customer to understand, that we really want to help and solve their problem, taking care about personalized support and understanding customers bad mood. 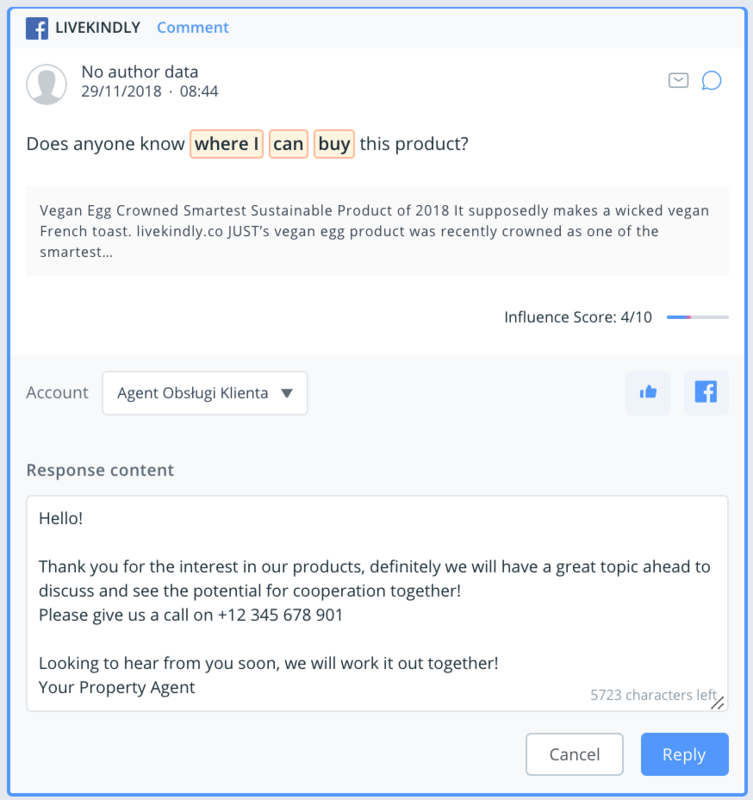 The fastest way to reach such angry customer is of course the social listening search – and even more, with SentiOne React we can right away respond to the issue and start building the customers satisfaction further. Together with our solutions you have a direct access to replying on many different, important sources across the web – starting from comments, posts in social media channels, through portals, forums and ending on private messages from main social channels available. Every digital buyer of XXIst century knows, that global online trade and services are being shared between e-commerce giants like Amazon, Booking.com, eBay and other market leaders are taking part in everyday battle to attract more customers, position themselves in more regions and take a bite from the global e-commerce cake, behind which stays a huge amount of money – the data from www.statista.com on e-commerce market evaluates the industry on the level of 2 842 billions of dollars in 2018 – and as we know, it’s not yet the end of the year! To make sure your products fit your audience’s needs and to avoid crises in the e-commerce industry, it’s best to track online discussions. This way you keep up with what the internet users (hence, your potential clients) are saying about your products or competitors. Online listening and customer management tools like SentiOne can help you to do so with just a few clicks. The investment in an excellent customer experience automation can go a long way. Eager to know more about the e-commerce market? Wait for the second part of our article! Influencers, unboxing and valuable tips, as well as the summary of e-commerce hottest offers this year are on the way! Jan Kołątaj Responsible for managing the relationships with SentiOne clients across the world. Highly interested in the way of how external relations are supporting business development and how the new technologies are shaping the digital era around us. Passionate about marketing trends and delivering value to the customers.